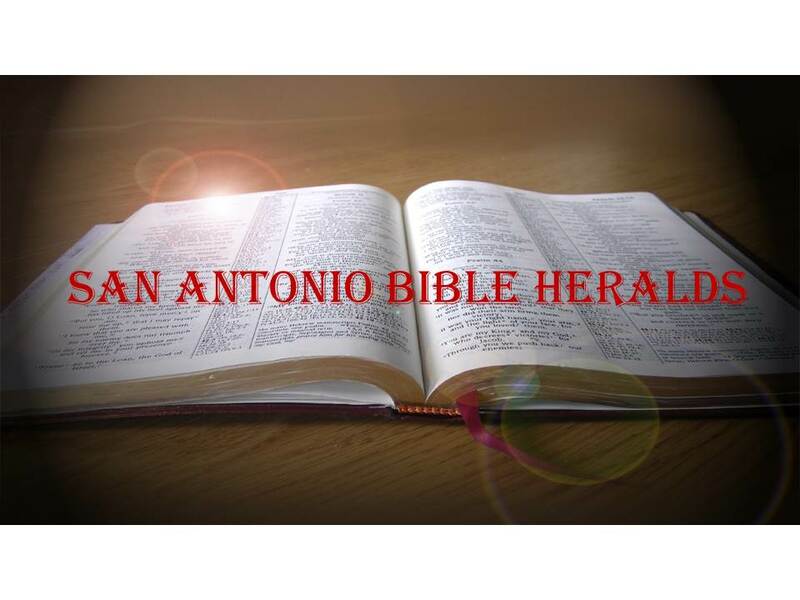 San Antonio Bible Heralds: "Like Others Who Have No Hope"
The world that Paul preached in was as varied and heterogeneous as our own. Although practically all lived under Roman rule, they had brought their religious "baggage" with them. Rome astutely allowed its conquered people to worship their own gods, ensuring that they would remain relatively peaceful and tame. The Jews, although monotheists in a world full of deities, were also allowed to retain their God. And it was from that soil that Christianity, the true manifestation of the Old Covenant and what it really meant, sprung forth. The Greek mind dominated the world of the first century. And when it came to resurrection and afterlife, the thoughts held by most of the philosophers was that the body was corrupt and needed to be escaped from. It was by escaping this earthly tabernacle that man could truly attain to the heights of all he was created for. As we see in Acts 17, to the Greek mind, the idea that the body would one day be resurrected was repugnant. After spending your whole life trying to escape the body, why in the world would you want to be stuck with it again throughout eternity? It is easy to see then, that Paul and the other gospel messengers had their work cut out for them. When the Spirit of God decides to convict and convert, however, no one can stand in His way. Enter the Thessalonians who, if we read the first and second letters to that church, were among the most faithful and staunch followers of Christ. Even in the midst of serious persecutions (see especially the first chapter of 2 Thessalonians), they had remained steadfast in their faith. But they had become worried about those who had died, many of them perhaps in the persecutions they had suffered. What would be of them in the resurrection, they asked. So Paul provides at once, both an answer and encouragement. He continues in the passage I began to quote above "For if we believe that God raised Jesus from the dead, we believe that He will bring with Jesus those who have fallen asleep...therefore, comfort one another with these words" (1 Thessalonians 4:14, 17). 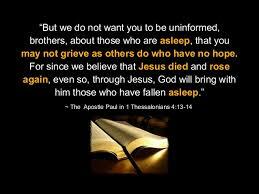 Paul does not tell the Thessalonians they are not to grieve. Rather, he tells them that in their grieving they should not lose sight of their hope: the hope that God will bring those who have fallen asleep with Jesus and that those of us who are alive at the time will join them and the Lord forever. Thus, we grieve, but we do so knowing the glorious end of our loved ones who are in Christ and our assurance that one day we will join them so that together we will "with one voice and one mind worship the God and Father of our Lord Jesus Christ" (Romans 15:6). Hope indeed! Amen hermano. Lo acabamos de leer yo y mis padres. Good thoughts Mike! Thank you for your encouragement! Thanks for your encouragement as well! !